I am looking to buy a Karastan Gaviota coast textured carpet for a large playroom, hallway and two bedrooms. There will be a lot of traffic in the playroom. It is a Stainmaster ultra life with Tactesse. It does not seem very dense, as I can see the matting when I separate the fibers. It does not tell the fiber density or number of twists. It's about $5 per sq. ft. I really like the color (It is flecked), but want the retention is more important to me. We have 8 children and pets. 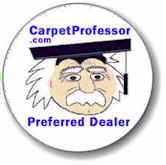 Could you please tell me if I should look at different carpeting and if frieze would be a better selection for me? Thanks for the info and your prompt reply! After looking through some of the paperwork, I just realized that the Design Alliance frieze I was asking you about is made by Coronet/Beaulieu (label: 3M Scotchguard). Is that a well-known brand? Yes, coronet, is a good company. They have been a leader in the carpet business for years. They have high-end and low-end carpets just like any other company. That doesn't mean that all their products are designed for your application. You need to consider all aspects of your carpet job: the carpet, the padding, and the installation. Only when you get all three done correctly will you have a winning combination. Combine all this with a fair price and you will have what I strive to offer my readers in my ebook! Feel free to email me if you need more questions answered, it's part of my service! 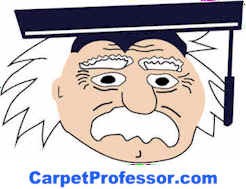 I have learned so much about buying carpet by reading your web-site. What a wealth of information! My husband and I have pretty much made up our minds about the carpet we are going to purchase for our living room and hall. I thought that I would run it by you first, just to see if we had done our homework correctly. We have two older children and no pets. We are looking at a Mohawk product called Bigelow Chateau. It is 100% DuPont Tactesse BCF nylon. Its face weight is 45 ounces. We will pay approx. $27/square yard. The pad that has been suggested is a rebond pad that is 8lb. for approx. $5/square yard. What do you think?